Kakki Sattai Tamil Movie released this Friday [Feb 27] on a grand scale all over the world. The movie that brings back the Varathapadatha Valibar Sangam stars Siva Karthikeyan and Sri Divya has hit 750 theaters worldwide with 370 screens alone in Tamil Nadu. Siva Karthikeyan is a happy man today. 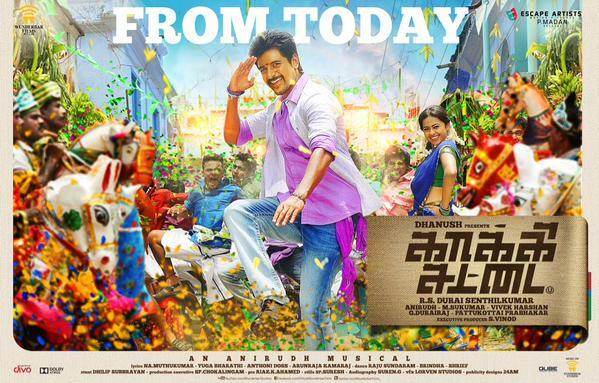 Kakki Sattai is his biggest release so far. After the success of Ethir Neechal, VVS and Maan Karate, the VJ turned comedian and an established actor, Siva Karthikeyan is expecting a consecutive hit with Kakki Sattai. In the second time combo of Director RS Durai Senthil Kumar, actor-producer Dhanush, music director Anirudh Ravichander and Siva Karthikeyan, Kakki Sattai showcases Siva in a powerful cop role. Kakki Sattai screening starts with the special morning shows in Thirrupur at 6:30 Am in the morning, followed by 8:30 AM shows in Sathyam, Ganga, Vetri, Vidya and other theaters in Chennai.